Father Christmas must be feeling particularly generous this year because Elemis have released details of an exceptionally tempting Today’s Special Value (TSV) with QVC this Sunday. Full details are being kept secret but I can reveal that you’ll be sitting on your fingers trying not to pick up the phone and place an order. Elemis’ NEW sp@home Pro-Radiance Hand & Nail Cream, the number one anti-ageing moisturiser Pro-Collagen Marine Cream (30ml), a full size Exotic Frangipani Monoi Body Oil (100ml), full size Tranquil Touch Indulgent Bath Elixir (200ml) plus one other full size hero Elemis product that will be revealed on the show – all packed in a luxurious high gloss navy make-up bag. Ooooh, mystery item! Oooh Frangipani Monoi Body Oil! Oooh Pro-Collagen Marine Cream! And a final “Ooooh” for the brand new Hand and Nail Cream that isn’t even being RELEASED properly until next year. Are you all oooh’ed out yet? I’m getting there. Seriously though, if you’re looking for an impressive Christmas present for your mum/daughter/sister/best mate/mother in law, this is a very nice-looking set. I’d prefer a snazzier bag to keep it all in but beggars can’t be choosers etc. etc. So, let’s get down to the nitty gritty. What’s it gonna cost you? Well, the exact price – in true QVC style – will be announced live on air but I *can* tell you that it will be under £40 and offer a guaranteed saving of more than 50% off retail. 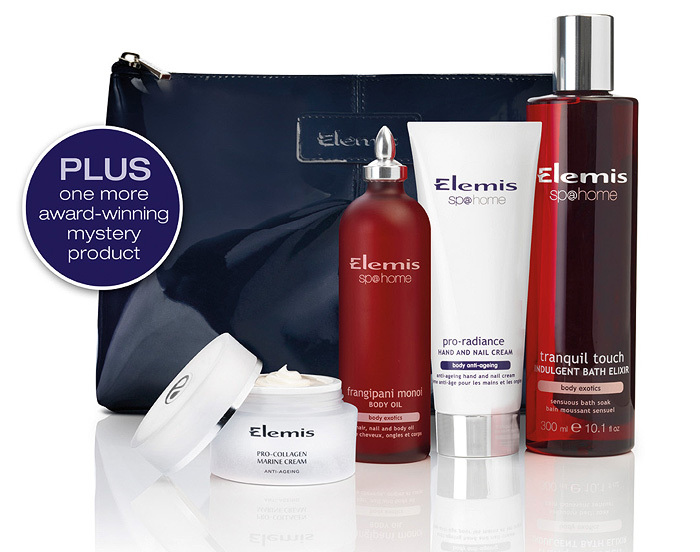 The Five Piece Tranquil Indulgence Face and Body Collection will also be available to purchase at www.qvcuk.com/elemis (item number 200194) and will be live from 20th November 2011. I’m setting an alarm to remind me about this! It is mine! And even better, it’s available on 4 monthly installments. Oh YES! Damn the midnight start, I cannot stay up for it, I tried but am just not hard enough! What a bad beauty junkie I am!